(Jonesboro, Ark.) Aug. 28, 2018 — Hytrol dedicated its renovated Technology Center on Tuesday. The ceremony, attended by local leaders, included an open house and tours of the more than $1.5 million updates to the facility. Hytrol Chairman of the Board Robert Jones charged those in attendance to continue to support Hytrol and in turn build a stronger northeast Arkansas commmunity. 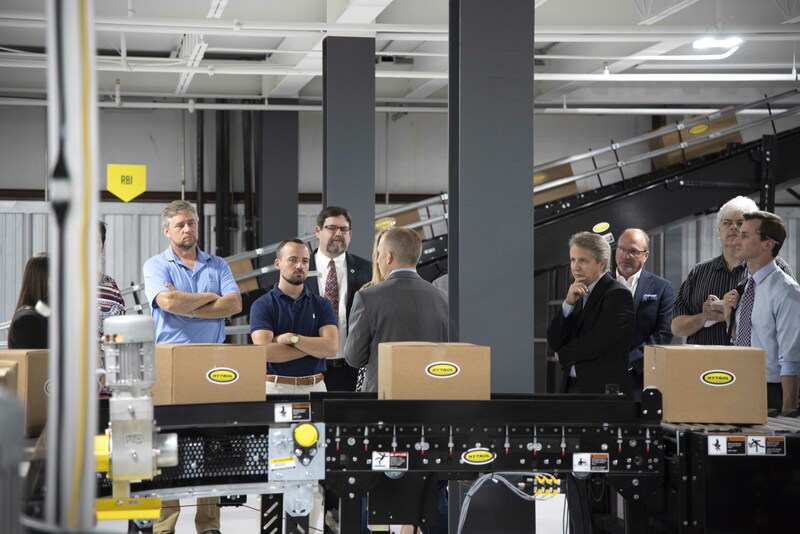 The 45,000-square-foot building was renovated to include 185 new conveyors comprising eight different conveyor loops spanning two stories for customer demonstrations. Hytrol will also be able to test customer-provided products in the area. The center also houses a research and development lab. The secure area is solely for new technology, product development and prototype testing. The lab features 10 test bays, a rapid prototyping area and a safety center. The renovation also entails an industry-exclusive augmented realty room that allows customers to experience their material handling design virtually before it is built or installed. Hytrol collaborated with the University of Arkansas at Little Rock George W. Donaghey Emerging Analytics Center to create the one-of-a-kind experience. Throughout the day Hytrol celebrated the dedication with employees by offering tours of the space. Hytrol designs and manufactures advanced conveyor systems, controls and solutions for customers with processing, manufacturing, warehousing and distribution needs. For more than 70 years, Hytrol has demonstrated an unwavering dedication to understanding the unique material handling needs of businesses. Hytrol is focused on creating innovative, customized conveyor solutions that help companies achieve their goals.